Remember how when we were kids, the summer was long and our task list was short? We awoke to wide open days, and warm months that seemed to go on and on. Now it’s just the opposite. Even though it’s summer, there’s so much to do, and the days and months zip by. One minute it’s Memorial Day, then suddenly it’s Labor Day. What happened to those lazy hazy days?? Since summer is a time to eat lighter and dress lighter, I figure it might also be a good time to lighten up on the daily pen carry. Especially since I’ll be hitting the road soon. 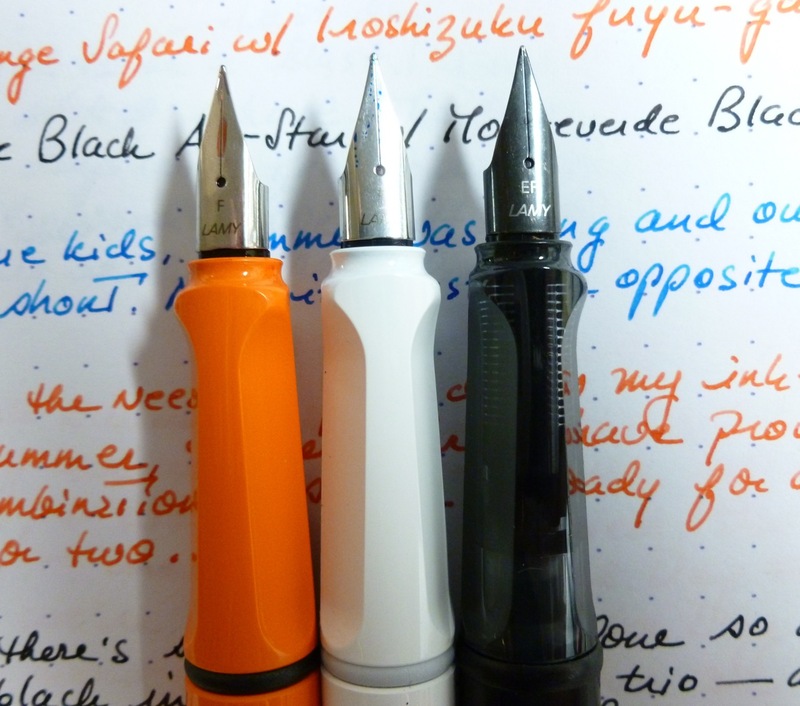 Here’s what I’m taking along– a trio of Lamys. 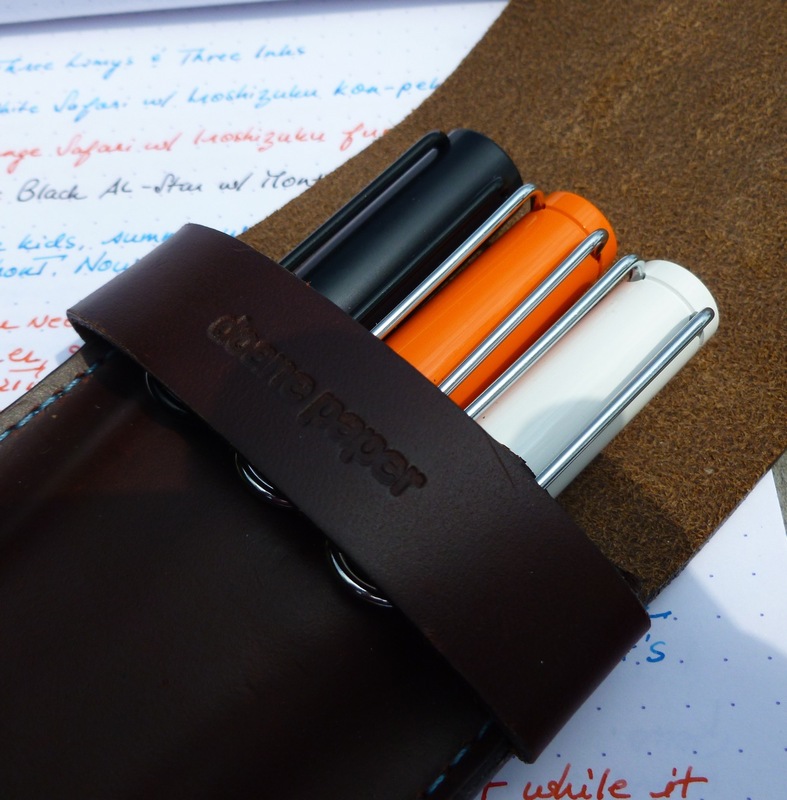 Lamys are a bit rough-and-tumble, as ready for the road as the office. 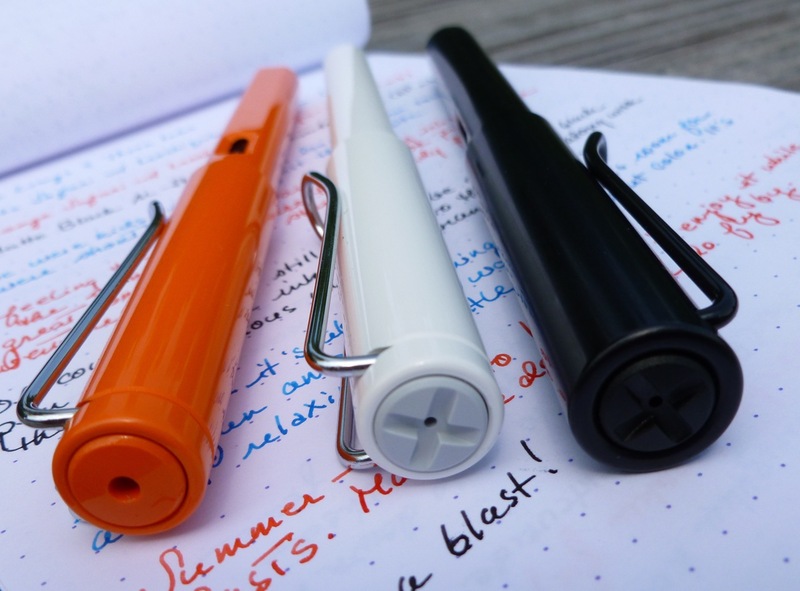 Light weight, sturdy, and easy to maintain, these are pens that won’t weigh you down and can take a bump or two. They’re as ready for an adventure as you are. I’ve loaded the white Safari with Iroshizuku kon-peki, a refreshing combination. The azure blue ink reminds me of the ocean, while the body of the Safari conjures up images of my pale, pale legs at the beach. Yup. Pure white. Just like the pen. 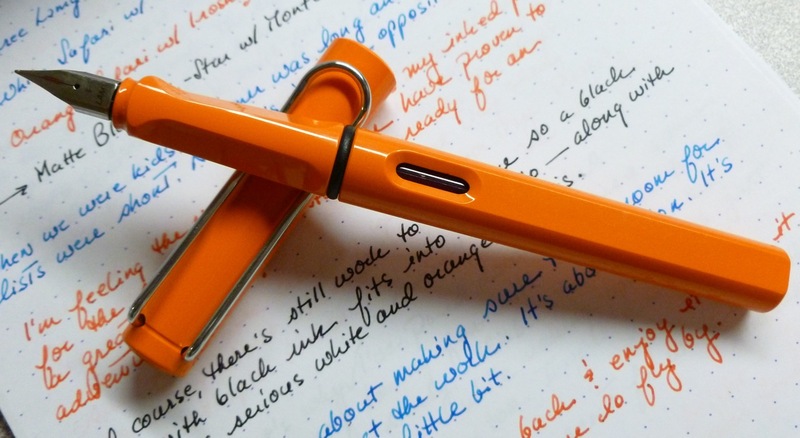 The orange Safari is filled with Iroshizuku fuyu-gaki, a pleasant well-balanced orange that’s bright and fun, but not blinding. This pen and ink combination is a real mood-booster, and I find myself looking for excuses to use it. And because there’s always work to be done, even in the summer, I’m keeping my matte black AL-Star, filled with Monteverde Black, close at hand. This pen is cool and stealthy. Monteverde Black has recently become a favorite and is as deep and dark as my post-vacation mood. Which is pretty dark. Summer’s here. I’m packing lighter. I’m packing Lamys. That’s the hand-written version up there. 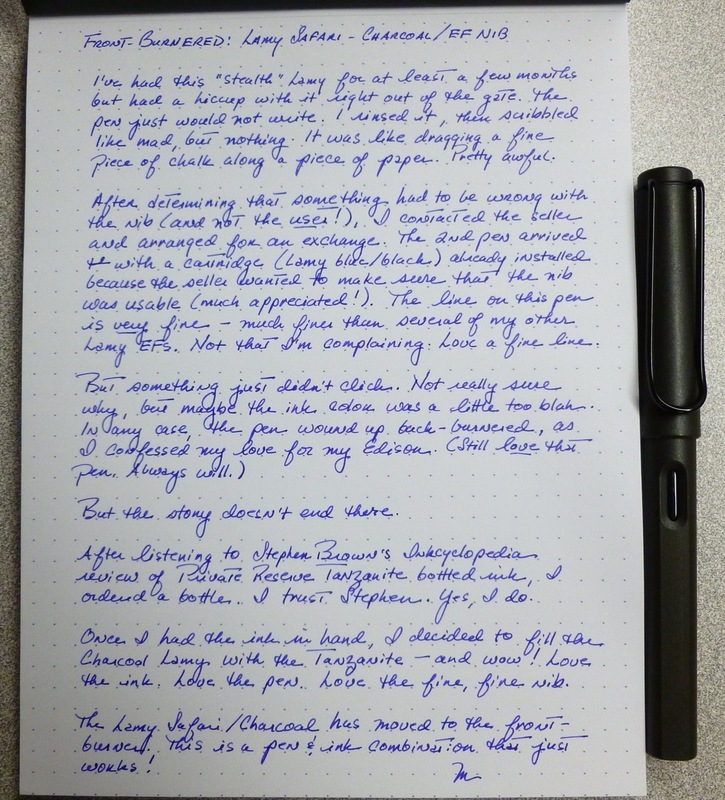 In a nutshell, I wasn’t as crazy about the “stealthy” Lamy Charcoal (EF nib) as I thought I’d be, but that was undoubtedly due to the fact that the first pen just wouldn’t write. I shot an evening trying to get it going before I shipped it off for an exchange. Once the second pen arrived, it wrote just fine…fine as in “good” AND fine as in “a very thin line.” But I just didn’t find myself reaching for it. Act II: Stephen Brown did an Inkcyclopedia video on the Private Reserve Tanzanite ink, and shortly thereafter, a bottle found its way into my online shopping cart. 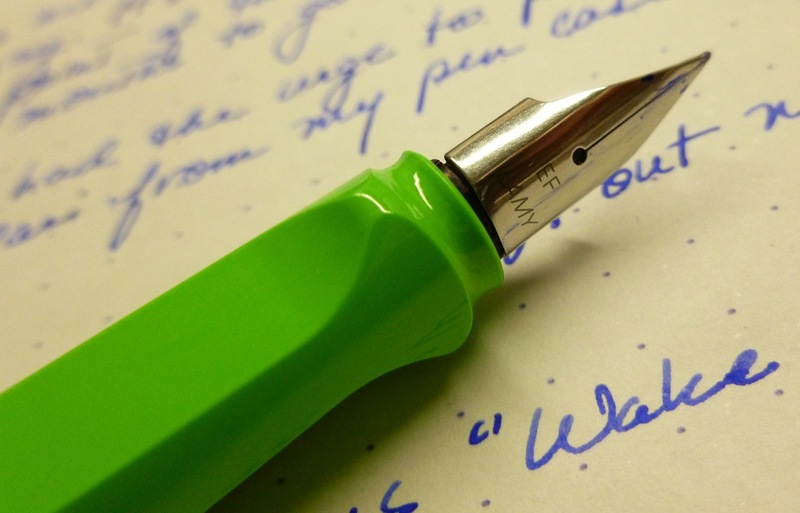 What a great pairing…the matte finish of the Lamy coupled with the purpley-blue (or bluey-purple) pop of the ink. Okay separately. Great together. The body isn’t what I would call a true black. To me, it looks like more of a deep espresso. 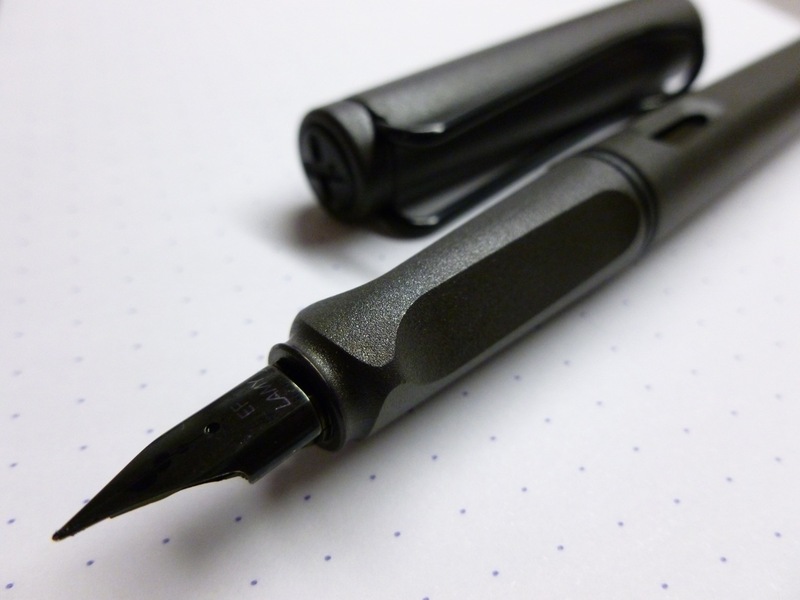 This Lamy is very lightweight and sports the signature clip in black, as well as an all-black nib. Understated and pretty cool. 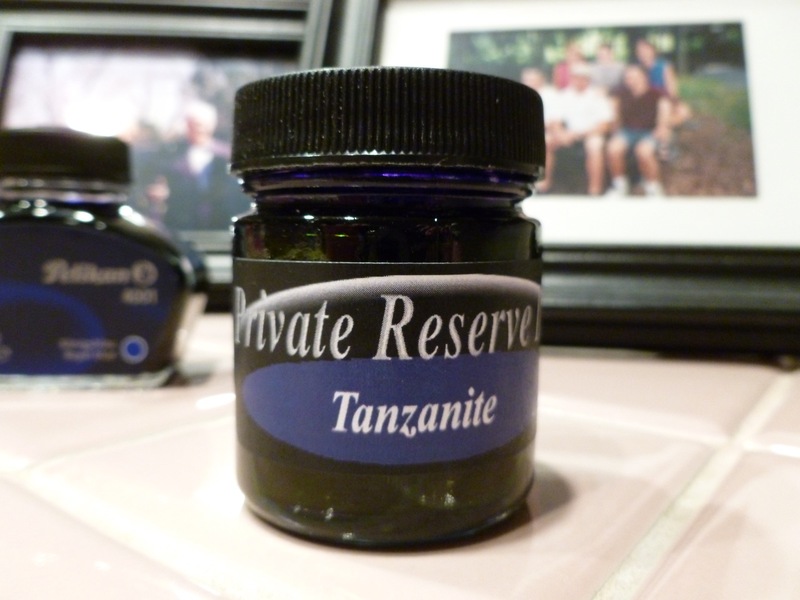 The Tanzanite ink is a super color– very fun, but not out of place in a business setting. It can party, AND put in a full day of work. Best of both worlds. I LOVE it. The ink bottle is very no-nonsense, with a nice wide opening so you can see what you’re doing when you’re filling your pen. I appreciate that, as do my counters. One is subtle. One not so much. Like lobster and butter (mmmmmm), this is a pair that was meant to be together. Where together? Why on the FRONT burner, of course.